Sitting down to a plate of chicken wings can feel like a cheat meal rather than healthy dining, but don’t assume this tasty treat isn’t beneficial. Wings have a surprising range of health benefits when eaten in moderation. Whether you’re at a sports bar enjoying the game or gathering at a friend’s house, consider these health advantages of wings. What’s So Healthy About Chicken Wings? Regardless of your gym goals, you need plenty of protein every day. Chicken wings have roughly 5 to 9 grams per wing. The fat content is higher than options like chicken breasts, making them ideal for those trying to gain weight or muscle. Fried wings are also relatively low in cholesterol, benefiting heart health. Chicken wings have a healthy amount of vitamin B6, which supports the circulation of oxygen throughout the body. This leads to an improved immune system, as well as a lower risk of coronary artery disease. Vitamin B6 also contributes to proper brain function. It supports the creation of hormones, such as serotonin and norepinephrine, that regulate mood and sleep cycles. Chicken wings carry two essential minerals: selenium and phosphorus. Phosphorus supports cell function so that your body maintains a healthy chemical balance. Selenium ensures that the body gets plenty of vitamins by keeping C, E, and others active. This benefits nearly every aspect of the body, especially the immune system. 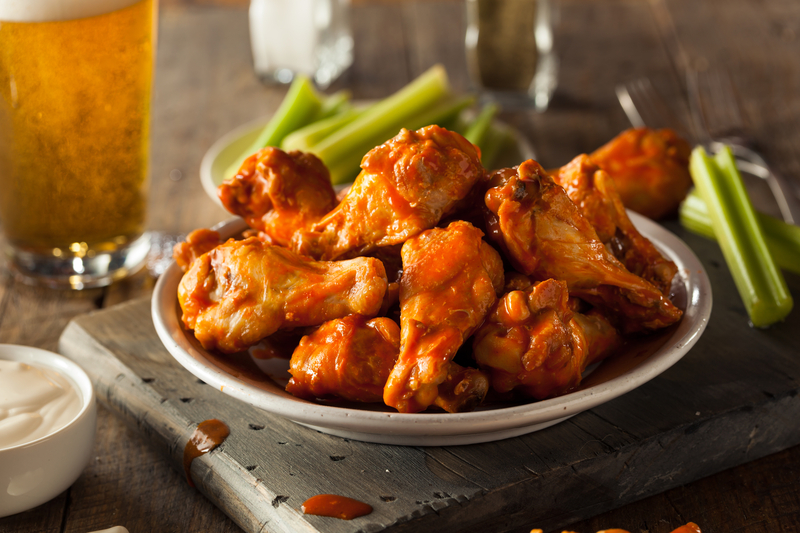 If you’re in the mood for delicious wings, stop by Buffalo Wild Wings. They have 19 convenient locations throughout New York and Connecticut and offer a wide selection of hot wings, burgers, and American food. Each location hosts multiple flatscreen TVs, making it the perfect place to watch sports with friends and strangers. Check out their menu offerings online and connect on Facebook for regular news and updates.